Ever wonder if your pursuit of exercise is supporting or hurting your health? Ever question whether or not you are overexercising? 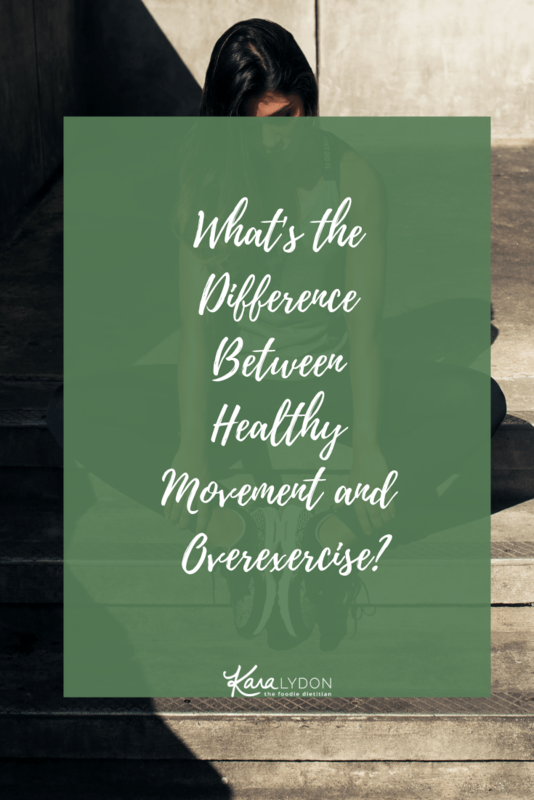 Today, we’re talking about the difference and line between healthy movement and overexercise. Hi guys! I’m excited to have my intern Michelle back on the blog today talking about the difference between a healthy relationship with movement and overexercise. This is something I see my clients struggle with a lot and I hope this blog post helps you sort through your own relationship to movement. Take it away, Michelle! If someone asked you what makes up a healthy lifestyle, you might list off habits such as eating well, prioritizing sleep, drinking enough water, and exercising. Exercise is certainly important for heart, lung, bone, and muscle health. It can even help our mental health, too! We hear all about how good movement is for us, but what about when it’s not? There are dangers of over exercise when things gets taken too far. For anyone struggling with and/or in recovery from an eating disorder, body image issues, or exercise addiction, it can be hard to draw the line between health promoting movement and too much excess stress on your body. How do you know if your movement is life giving or energy depleting? I’d love to help you figure that out! If group fitness classes, gym appointments, or runs outside are absolute necessities regardless of weather, schedule changes, or how you’re physically feeling that day, that’s a sign that things might be too rigid. It is normal to take rest days or unexpectedly cancel a gym session when something pops up in your day. If that causes significant stress and anxiety it might be time to step back and evaluate your relationship with exercise. Another red flag is the time spent working out. Do workouts last hours? Do they interfere with or prevent you from making other plans? An effective workout does not have to be long! Short bursts of movement can have positive health benefits, and longer ones don’t have to happen every day. If you find that you don’t have time for other activities because they would take away from gym time, then gym time might be too much time. This is especially noteworthy if you are skimping on sleep to get in a workout. Having a plan for what you want to do in a given week is fine, and goals are important! Flexibility is also key. It might be helpful to think about different aspects of your health and how a more flexible exercise plan will cater to all of them. 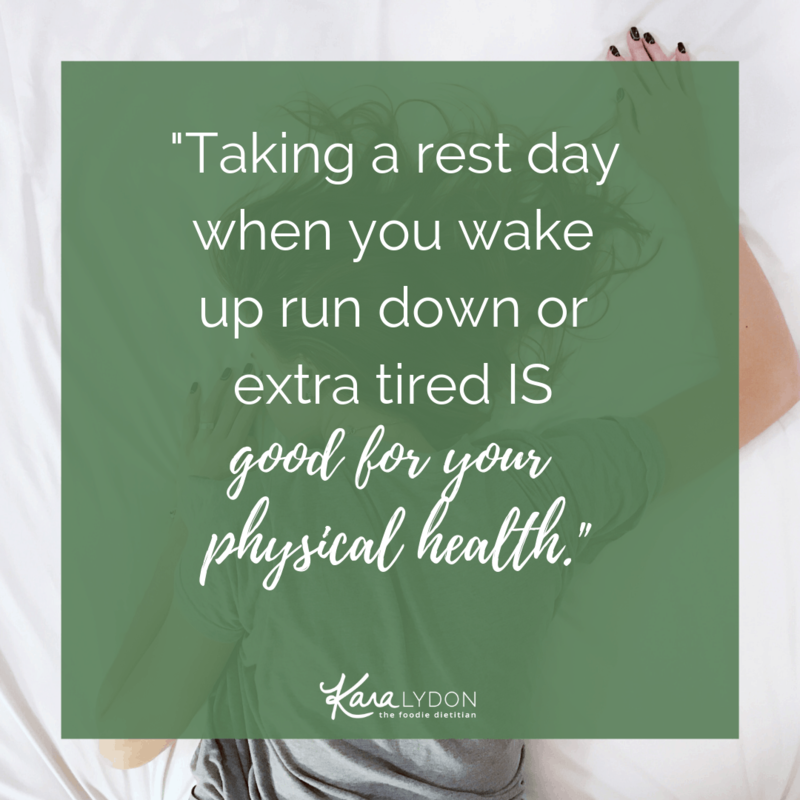 Taking a rest day when you wake up run down or extra tired IS good for your physical health because your body needs rest in that moment to become stronger; a workout would just bring you down. Skipping your after work spin class because you just found out a friend is in town is catering to your mental health- it’s important to nourish connections and relationships to stay happy and motivated to continue caring for yourself in all other ways. 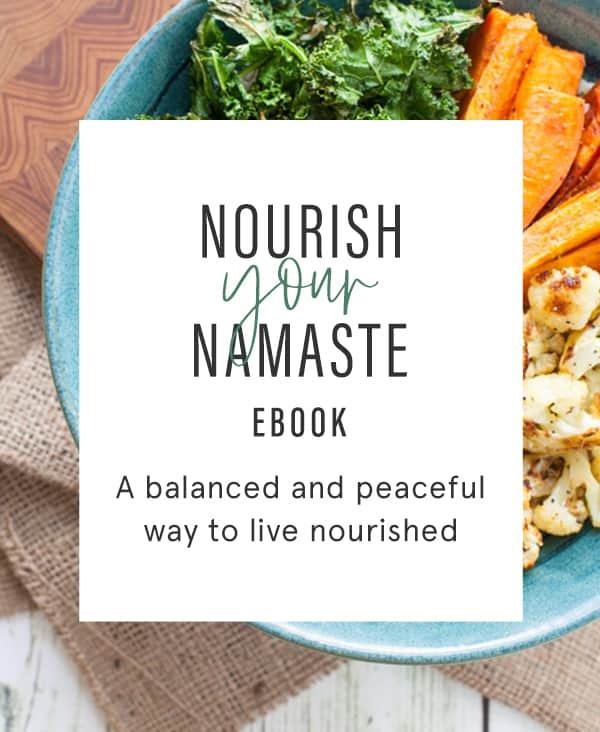 Spiritual health is also important, so maybe that means trading a bootcamp for a restorative yoga class, skipping Sunday morning at the gym to make it to church, or trading in weights for a meditation pillow to channel a little more zen every now and then. If you feel pulled to always have an intense workout, remind yourself that health comes in many forms and a wide variety of activities can contribute to your overall health. Instead of blocking out hours of time on your calendar for mandatory workouts, try alternating shorter and longer days of movement, and try to cap things at 45 mins to an hour (less is totally fine!). Before scheduling a workout, make sure that you’ll be able to get an adequate amount of sleep – that means 7-9 hours! – the night before. You could also try writing down priorities and favorite activities so that you have a list of things that take precedence over a workout if they come up as a conflict. Maybe you’ll write down dinner with friends, an outing with family, or a chance to see a one time event. If one of those happens at the same time as your workout, you’d cancel the workout! Try getting clear on where exercise stands in terms of things that are important to you and bring you happiness. The way you choose to move should bring you joy, but it should also be balanced with other parts of your life that bring you joy. For me, I know that exercise makes me feel good and energizes me. I truly enjoy it and love having it as part of my routine. That being said, I have no problem sleeping in when I had a late night and skipping my planned run or gym day. 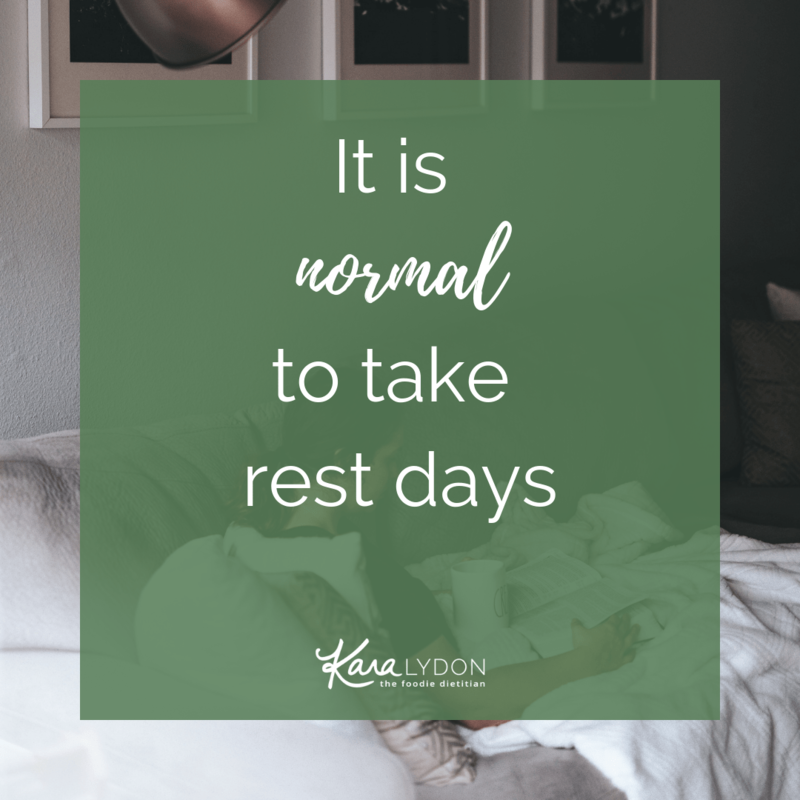 It’s all about finding the balance between resting, but not taking too much time off (for me!) since I do get energy and enjoyment from movement. Positive health habits are important to incorporate into your life, but taking certain habits too far might end up taking away from your health. When exercising, try thinking about whether or not you enjoy your chosen activity, how you feel after your workout, and what your motive is. Aim for joy and for exercising to achieve that feeling rather than a certain look. It is possible to cultivate a positive relationship with exercise, it just takes introspection and time. Michelle is a soon-to-be dietitian currently working in the field of eating disorder treatment. 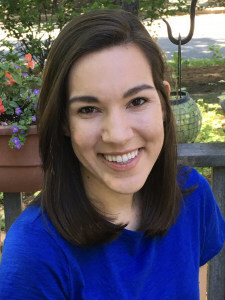 She is a recent MPH grad from UNC Chapel Hill and will sit for the RD exam in 2019. Michelle did her last internship rotation in residential ED treatment and enjoyed working with that population. 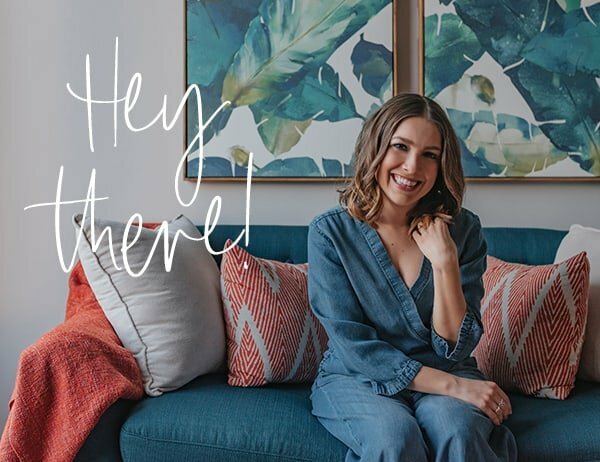 No matter what the first RD job is, she’s passionate about intuitive eating and hopes to help people recover from eating disorders in her career! Great points and so timely! 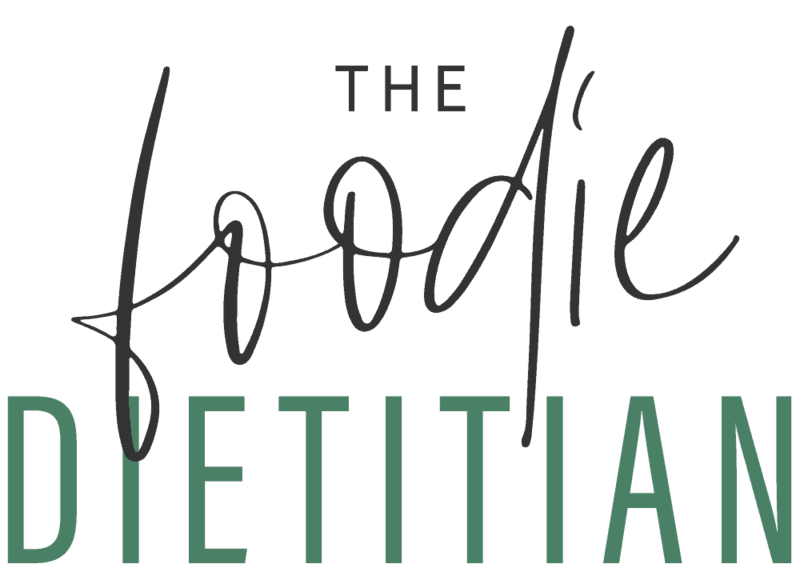 Even as a dietitian, we need to be mindful of these tips personally! Great points. What’s ok for one person may be way too much for another. I learned that the hard way. Great tips! Just like how you can go overboard with a diet or eating plan, it can be easy to go overboard with exercise too. It’s great information to help us understand the balance and rest our bodies need. Thanks for sharing! These are great tips! It’s good to know when to re-evaluate and check-in with motives, intentions, goals, etc. Great post! It can certainly be a fine line! Excellent comparison. So many people will benefit from this! Rest Days are SOOOOOO important! When I taught kickboxing, I can’t tell you how many people would drag themselves to class injured and tell themselves they needed to “push through it” in order to stay on top of their fitness goals. Promoting the importance of rest days and self care are equally as important as fitness. With the uptick in gym memberships sold around this time of year, this post is so timely and a great reminder that more and doing exercise you don’t enjoy isn’t necessarily a good thing!